Kawthar was nominated by a WOW Woman, Mona Arafat. Our meeting was a blind WOW Woman date if you will. 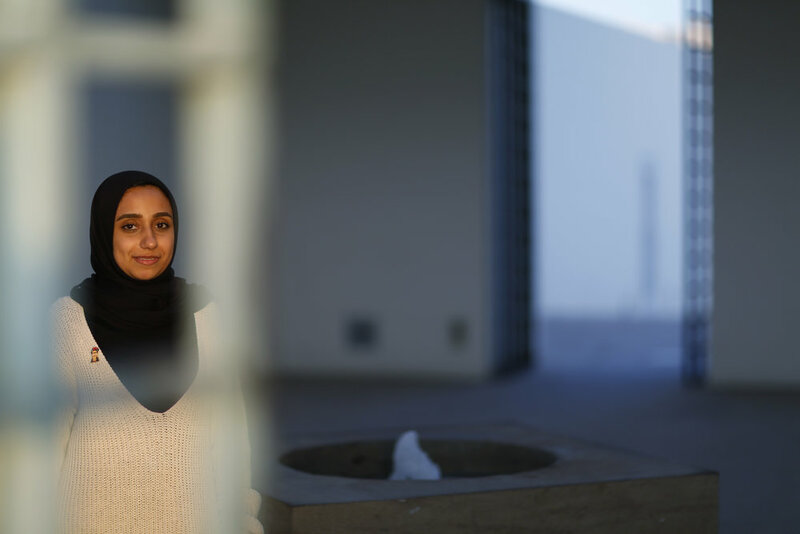 Sagacious and erudite, Kawthar has varied experiences under her belt that shaped and secured her impassioned way of thinking, certainty in her convictions and unconditional love and dedication to her family. 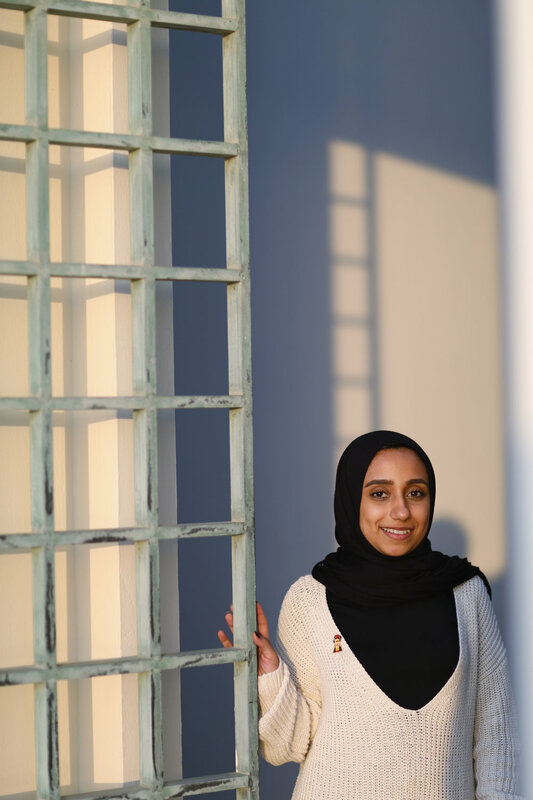 She pulls from diverse experiences in the US as well as the countries of the Gulf Cooperation Council (GCC) and has a unique perspective on life in the region as well as immense pride in her country and hope for its people. Please enjoy the Q/A with Kawthar, and photos taken near the remains of the 16th-century Portuguese fort called Qal'at al-Bahrain (in Arabic: قلعة البحرين‎) in Bahrain. I am a programs and projects manager at an international organisation. I am responsible for a portfolio of art, culture, education and skills programs and projects. We work with local and external partners to build capacity, share and exchange experiences and cultures as well as upskill youth and professionals in the areas of our work. I am the eldest of eight siblings, born to the most selfless, hardworking and big-hearted parents. My family is and will always be a big part of me and my journey in life. The bond between us is strong; despite us being quite different sometimes, we’re a solid unit. Because of my family, I learned how to be a team player, have empathy, compassion, and above all, express and receive unconditional love. I cannot name one turning point which got me to where I am, but I can say that I have had many amazing people along the way; family, friends and teachers, who have all contributed to my life experience in a way that broadened and enriched my understanding of the world and helped me become the person I am today. I could perhaps say that my college experience has definitely shaped me and paved the way for my path in life. On the academic side, my program was different from anything we had studied in school, and it was such an eye opener in many ways. I was very fortunate to have excellent teachers who I still try to stay in touch with until today. At the same time, college is where I started my extracurricular activities and had my beginning in event and project management. It was through this work that I discovered my passion for programming and working with young people. On the personal side, I have made many valuable, lasting friendships in college, and also met my partner, who later became my husband. Right after college, I was able to join a leadership program through the US Embassy in Bahrain. It consisted of academic and professional components, bringing together 17 people from MENA to the States. The academic part was a one-month, intensive course in civil society, conflict resolution, and communication at Syracuse University. We were then matched to internships with organisations in Washington, DC for two months. I was working at two internships simultaneously: an NGO focusing on youth-engagement and empowerment as well as a well-known advocacy group for Arab Americans. I am proud that at the age of 30, and despite many challenges and difficult situations that I have been through, I stand here today, with a successful career and a beautiful family of four. It’s not a solo job though; I wouldn’t have been able to reach here without my great support system of family and friends, which I am blessed and grateful to have. I still have a lot of energy and would like to do more with my life going forward, which I am exploring and thinking about right now. English Language Literature and American Studies. I have always had a plan for my life, and it’s sort of unfolding as I imagined, but everything happened a lot faster than I anticipated, in my personal and professional life. The experiences that I’ve been through and learned from, on both aspects, have extremely influenced my way of dealing with life and people. I am still me, I will always be, at the core, the same person, but I believe I am stronger, more resilient and I’ve developed a more critical eye in general over the years. A few times, when certain life events caused me great grief and once, when I had lost hope as a young person, and felt like life was giving me a reality check- I got really depressed for a long time. It’s one of those things that your heart never really recovers from, but you learn to cope and move on. I needed time to get back up on my feet and in every one of those times, I found courage and solace in my community. We often see the negative side of our close-knit society, the gossip, the social obligations and so on, but I have learned to appreciate it as well in times of hardship and need. The way we come together to handle grief as a community, the collective support, can be quite consoling and strengthening. You feel like you are not alone, you never will be, and sometimes, that’s all you need to keep going. Know your worth and don’t underestimate yourself. Be vocal about your thoughts, your feelings, your frustrations and your dreams. Do not stop, for anything or anyone, because you are stronger than you know. Don’t wait for others to treat you right, you can tell and teach them how to treat you. I have recently been thinking about the subtle misogyny in our communities, everywhere, where on the surface we seem advanced in women rights and gender equality, but underneath it all, women are still often offended, belittled, brought down and restricted by stereotypes, traditional gender roles, misconceptions and even legislation. Sometimes it’s something as simple as a joke or a meme, but without realizing it, it goes a long way in creating impressions and unconscious bias in our brains. Before men, I would like to see women open their eyes, and break through these barriers. When men share responsibilities with women, or when we achieve equal rights in one area, it is not a favour; it is our right and their duty as well. Another important point for me is, a lot of women who lead successful and/ or very demanding professional lives, feel pressured when it comes to their family/ personal lives. They are either judged under the assumption that they are neglecting their family, or the notion that only single women can focus on their career. This also results in creating a fear for women who have or want to advance in their career, discouraging them from starting a family or if they do, they end up feeling self-conscious and hesitant about demanding their rights or being outspoken about their family life, children, balancing motherhood and work life. Women shouldn’t have to shoulder that weight on their own, in fear of jeopardizing their professional image. In many workplaces, the question of maternity leave and nursing hours or childcare benefits or emergencies almost always reflect negatively on female employees. Rather than recognizing these as natural human rights for mothers and children alike, they are viewed as a burden. Women are conscious of that, too conscious of it, which causes the reaction among them not fight for these rights at the risk of being seen as less dedicated than other colleagues. Know all of this. Own it. Don’t censor yourself, your creativity, your voice. Love yourself. Be yourself, completely and unapologetically. One of the most important points would be to continue working on defying the stigma around feminism. We need more of that. There are many people, including women, who shy away from the term or consider it an extreme end of the conversation. I also think that we need to celebrate all kinds of women. Many highlights and features will focus on career-driven women or those breaking barriers, which of course is important and necessary, but I also believe that we need to also shed light on ordinary, every-day women. Breaking barriers and standing tall might look different from where different women stand, and we need to acknowledge that and celebrate all kinds of women, everywhere. In addition to that, one of the encouraging movements we’ve had in recent years is the He For She movement. I felt it was a great step forward, because it represented openness, engagement and wholeness in the conversation. I think good things will come, we just need to keep going, keep communicating our messages as clearly and loudly and inclusively as possible. On the personal side, it’s with my family. The love and support of my husband and also my children; the feeling that they look up to me and the way they look at me, it’s where I feel I matter most. At work, it’s when we do projects with young people. The skills programs that we deliver, exposing them to opportunities, life lessons and self-exploration exercises, supporting them and helping them see that they already have the tools to reach their full potential, that’s when I feel my job matters most. It feels like this is the whole point of my work. Although I haven’t had the luxury of spare time to focus on it, I love and enjoy writing. Since I was a teenager and throughout college, writing has helped me express my emotions and process a lot of feelings. After college, between an extremely demanding job and raising two young children, it became difficult to find the time. However, three years ago, I was fortunate to get the opportunity to participate in a special course with the University of Iowa’s International Writing Program. The course was titled “A Room of One’s Own; developing the female authorial voice”. It was a great course and also a wonderful experience with fellow female writers. Sharing our stories and our work gave me such drive and joy. At the end of the course, a collective book was printed for us, featuring a piece for each one of us. After it was over, a group of us decided to continue to meet and write, which we did. Our group was called Literal.BH. We had to stop meeting after about a year, due to difficulty in scheduling the meetings and other commitments. I’m really proud of these women and I adore their passion and their creativity. I hope that we can come together again as a group. I want to have more time to be creative, whether personally for me or in my community. I want to grow out of my nine to five job (as much as I love it) and be able to do more and give back more. The challenge would be finding the right set-up to do this efficiently. I also want to learn more languages. A language, to me, is whole new universe; a world of new challenges, culture, details and stories that I can discover through words. My greatest fear in life is loss of or separation from my loved ones. There’s no overcoming that. It’s a fact of life. It happens. It has happened to me. I’ve learned to deal with it. But it still can be an all-encompassing fear that I can’t shake sometimes. Love, dreams and really good music. Finding your inner peace; if you learn to shed all insecurities and inhibitions and just find that spot inside you, where your heart is still and you know your truth, that’s a good start. It will carry you through most things in life. Another ingredient would be people, good people, who make your life better, who make your heart smile. 18. What advice would you give your 14-year-old self? Not to seek validation from people, and focus more on myself. Give love only to those who deserve it. Worry less about my size, fitting in and looking all grown up, and believe more in my talent and potential. I’m currently re-reading my Harry Potter books. Sounds geeky, but in fact, whenever I’m going through a stressful time and I need to calm down, this is what I read. These books have accompanied me through some of the best and worst times of my life, and every time I read them I go to a better place. They’re my secret escape. For gifts I usually go with best sellers or something I know the person wants. But if there’s a book I gifted more than once, it’s 1984. I gave it to my younger brothers as food for thought. My wow women in my immediate life, are my mother and my grandmother, because they have had the most influence on me as a woman, and also because of their stories, what they’ve gone through and accomplished, each in their own way, within different points in history. They are the strongest women I know. Someone I would nominate is a friend of mine, Nazeeha Saeed. She is definitely one of the wow women in my life. She is bold, genuine and just inspirational in many ways. From history, I always admired Frida Kahlo. I truly admire her courage, resilience and how she pushed through all sorts of barriers and obstacles and still managed to tell her story, in her own voice, her version of the truth. I wish I could tell her how inspirational I find her and her journey. My online presence is currently only on social media, and private. But I do have a LinkedIn account, which has my contact details.